Teenagers are normally trendy and most of them are keeping up with what’s in and what’s new in terms of fashion. Though older adults may miss the reference of the teenager dressed as the most popular pop star at this point in time, chances are that the other adolescents would know exactly who is being portrayed. Ariana Grande, Iggy Azalea, Beyonce, and Katy Perry are some of the most popular stars of today and people, especially the young ones, idolize them. 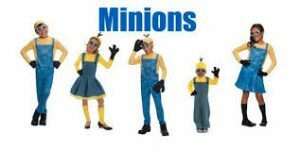 Other famous movie stars and characters like Harry Potter are also considered when picking a good costume to wear for this upcoming Halloween season. The Glendale shop keeps it simple and easy for Halloween enthusiasts to find everything they need to stay on top of the latest costume trends. Remember, whether you’re looking to pull off a frightening scare, or you are going for a cute and mystical costume, we’ve always made certain to have something for every taste and style. Glendale costumes also come with the best qualities, so consumers can expect to have these for many years. You will feel totally comfortable and confident when decked out for the evening!